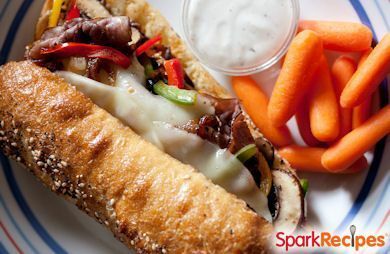 We've slimmed down this classic hefty sandwich--so you can enjoy it more often! * Feel free to add sliced peppers to the recipe if you prefer. ** We took some help from the prepared food section of the supermarket and picked up some precooked roast beef. You can swap lean deli roast beef, but it will add more salt to the recipe. The trick to making the lean beef and veggies taste like the real deal is the "fond," the crust that develops on the bottom of the pan. Instead of leaving those tasty bits in the pan, we scrape them up to create a mouth-watering sauce. To make the pita more pliable, microwave it for 20 seconds. Desktop dining: Skip the step of melting the cheese in the pan. Allow the meat and veggies to cool completely, then pack into a resealable container and top with the cheese. Pack the pita in a zip-top sandwich bag. Reheat the filling in the microwave and assemble the pita just before eating. Place a small skillet with a lid over medium heat. Once the skillet is warm, pull it away from the heat and coat with nonstick spray. Return the pan to the heat and add the onions, mushrooms, thyme and pepper. Cook for five minutes, until the onions turn golden brown. Add a tablespoon of water to the pan and stir well. Use a wooden spoon to scrape the browned bits off the bottom of the pan. Add the beef to the pan, and stir to combine. Top the meat and vegetables with the cheese. Cover the pan and cook until the cheese melts. Remove from heat and fill the pita pocket with the meat, veggies, and cheese. Serve immediately. Serving Size: Makes 1 sandwich. Really enjoyed this - great amount of flavor! Very quick and easy to make. Great for on the rush lunches. We used a wheat pita, warmed in a pan with a bit of butter, Italian seasoning and Romano cheese to bump it up. We made a quick au jus with beef broth, 1/2tsp butter and pepper. Put all broth in with meat and veggies, then drained back out for dipping. Awesome!